The vibrato, rotary effect is by far my personal favorite effect when it comes to pedals. I know it doesn’t have the same punch as a classic distortion or fuzz and maybe it doesn’t create the same type of dreamy atmosphere that reverb does, but pulsing tonal thrum of a good Leslie replication just speaks to me. Apparently, it also speaks to the folks at DigiTech who just released the Ventura Vibe – an effects pedal that has three rotary/vibrato effect types both vintage and modern. 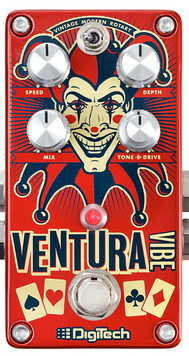 As you can see from the graphics on the pedal, the Ventura is meant to be a bit of a carnival in a box. It’s an effect that “will twist your equilibrium adding spinning, swaying movement to your guitar playing.” What’s crafty about this pedal is that it has a tone and drive knob. This means that each of the three rotary/vibrato effects can be dialed in and even distorted. The more you push the tone/drive knob the closer to vertigo you get. This is a great pedal to punch up the crazy on that next atmospheric piece you put together. Let us know if you get this pedal on your board. We always want to hear what people are thinking about the new gear that’s spilling out onto the virtual shelves. AND, don’t forget that you still have some time to enter into our current giveaway for an Outlaw Effects Boilermaker Boost!